The defendant was charged with robbery with a dangerous weapon and first degree murder. The defendant was 16 years old and a ninth grade student when the crime occurred. The jury found the defendant guilty of first degree murder based upon both felony murder and malice, premeditation and deliberation. The trial court was required to decide whether the defendant should be sentenced to life imprisonment without parole, or life imprisonment with parole pursuant to Part 2A of Article 81B of Chapter 15A of the North Carolina General Statutes. The trial court entered an order and subsequently a judgment sentencing defendant to life imprisonment without parole. Judgment was arrested on the robbery with a dangerous weapon conviction. On appeal the defendant argued that the trial court erred by imposing a sentence of life imprisonment without the possibility of parole where it failed to identify any mitigating factors present in the case. The Court agreed. In the present case, the Court found that the trial court’s findings of fact and order failed to comply with the mandate set forth in N.C.G.S. 15A-1340.19C. The trial court’s order made cursory, but adequate findings of fact as to the mitigating circumstances set forth in N.C.G.S. § 15A-1340.19B(c)(1), (4), (5), and (6), but the order did not address factors (2), (3), (7), or (8). The Court stated that factor (8), the likelihood of whether a defendant would benefit from rehabilitation in confinement, was a significant factor. Rule(s): absent formal arrest, the fact that police have identified a person interviewed as a suspect and the fact that an interview is designed to produce incriminating responses from the person are not relevant in assessing whether that person is in custody for Miranda purposes. Petitions were filed against juvenile alleging that he committed felony breaking and entering, felony larceny pursuant to felonious breaking and entering, conspiracy to commit felony breaking and entering, and violated local curfew ordinances. The juvenile filed a motion to suppress the statements made to the police, asserting that he was not advised of his rights under Miranda and N.C.G.S. § 7B-2101 prior to the interrogation. At the adjudication hearing, the trial court denied the juvenile’s motion to suppress, finding that given the totality of the circumstances, no custodial interrogation had occurred. The juvenile admitted to one count of conspiracy to commit felony breaking and entering and the trial court adjudicated the juvenile delinquent and placed him on supervised probation for nine months. The juvenile appealed arguing that the trial court erred by denying his motion to suppress, asserting that his statements resulted from a custodial interrogation. The juvenile contended that the circumstances found in In re D.A.C., which the trial court used as guidance in determining if the juvenile was subject to a custodial interrogation, were distinguishable from the present case. The Court disagreed finding that similar to In re D.A.C., the juvenile’s mother had scheduled the meeting with the police and invited the officers inside her home for the meeting. The juvenile was fifteen years old on the date of the interrogation and the detective was aware of this fact. The detective testified that when he asked juvenile a question, his answers were given “freely.” The conversation took place in juvenile’s home at 4:00 p.m. so it was still light outside. The detective wore civilian clothes while the other officer was in uniform. The juvenile was questioned in the presence of his mother. Although both officers were armed, neither reached for their weapons at any point in the conversation. The juvenile was not handcuffed or physically restrained in any way. At no point throughout the conversation did juvenile or his mother ask the officers to leave or request to end the conversation. [a]lthough any interview of a suspect will necessarily possess coercive aspects, Miranda warnings are not required simply because the questioned person is suspected by the police of wrongdoing. In fact, [a]sent indicia of formal arrest, [the facts] that police have identified the person interviewed as a suspect and that the interview was designed to produce incriminating responses from the person are not relevant in assessing whether that person was in custody for Miranda purposes. In some case law, the court considered the juveniles’ failure to comply with SROs. See, e.g., In the Matter of T.S.B., (unpublished) (three separate disruptions over a two hour period, causing one teacher to leave her class unattended for several minutes, and not complying with the SRO, constituted a “substantial interference with the operation of the school.”). One could argue that dealing with disruptive or disciplinary matters is a component of an SRO’s job. For that reason, behavior requiring more than the officer’s minimal involvement may not substantially interfere with school operations. The argument may be made that rather than preventing the officer from doing her job, dealing with students behaviors are a requirement of the job. This may be distinguished from disobeying administrators, given the differences in duties. Principals and assistant principals supervise personnel, interact with superintendents and the community, coordinate, and manage school resources. Time spent dealing with student misbehavior is time taken from doing entirely different work. This may be relevant evidence to provide the court to help it determine whether your client’s behavior substantially interfered with school operations. Analysis of a disorderly-conduct case often depends how much time school staff spends dealing with the juvenile’s behavior. Courts have frequently invoked language including “several minutes.” See, e.g., In the Matter of M.G. (2003) (because the physical education teacher was away from his assigned duties “for at least several minutes,” the juvenile’s conduct “substantially interfered with the operation of the school.”) and In the Matter of Q.P.W. (unpublished) (loud swearing in a hallway, causing two principals to respond to the incident, may constitute substantial interference with the operation of a school). Specifically, a disruption may last several minutes or “not … more than several minutes,” In re Brown (2002). Where the court describes the disruption as lasting “several minutes” or “at least several minutes,” the juvenile is typically adjudicated delinquent. See, e.g., In re Pineault (2002). Where the court describes the disruption as lasting “not … more than several minutes,” the juvenile typically is not adjudicated delinquent. See, e.g., In re Eller (1992). The inherent vagueness of “several minutes” could become a significant litigation issue. First, the case law does not define the phrase clearly. Second, even if the phrase itself were given a clear definition, any period of several minutes could still be described in both ways at the same time (i.e., both as “several minutes” and as “not … more than several minutes”). Because these cases do not provide definitive clarification of these issues, defense counsel may want to consider adjudicatory hearings in disorderly-conduct cases. You may access all of the disorderly-conduct cases by accessing our case law compendium on our website by clicking “Case Law” on the Materials for Defenders page (under the Information for Defenders tab, above). We would again like to extend our thanks to Howard Lintz, Pro Bono Legal Associate, for this analysis and his work in reformatting and organizing both the individual cases, and the Case Law Compendium itself. His insight and attention to the most minute of details has been invaluable. 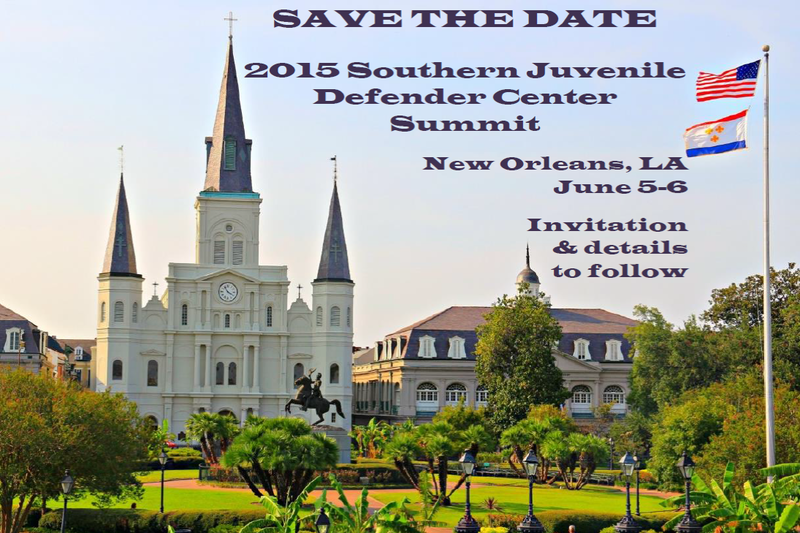 Please see the invitation link below for the 2015 Southern Juvenile Defender Center Summit, June 5-6 in New Orleans. Registration is free, and scholarships for lodging are available for those who share rooms; travel is not covered. As in years past, the conference runs all day Friday (June 5) and through Saturday morning (June 6) before adjourning at lunch time. The Summit will address a range of topics relating to advocacy on behalf of youths in the juvenile justice system, with particular focus this year on effectively addressing matters relating to race, both in and out of court. Space is limited, so if you wish to attend, I encourage you to register at your first opportunity. Feel free to contact our office if you have any questions. Throughout the country, there have been great efforts to end bullying. School districts throughout North Carolina have started anti-bullying campaigns and initiatives. While all of these efforts are greatly impacting how bullying is perceived and how it’s handled, bullying unfortunately is still a problem for some students. How does juvenile court respond when a child that has been bullied reacts and fights back? In my short time as juvenile defender, I have already come across many cases where students have reached their last straw. Should children who have been a victim of bullying automatically be diverted? Should they be placed on probation for 12 months when they were the victim? About six months into my practice as a juvenile defender, I was assigned a case where my client told me she had been bullied. She was charged with simple assault for fighting with another girl in her middle school. My client was very straight forward with me. She told me that she did hit the other girl. It wasn’t self-defense. She was the person who threw the first punch. She also told me that this other girl had been bullying her for months. This girl had a group of friends that would harass my client. This other girl had even followed my client home on several occasions threatening her. My client was afraid of going to school. While teachers at the school were monitoring the situation, my client was afraid that one of the girls’ friends would do something to her. This case was interesting because both children were charged with simple assault. Because they were at the same school, both of the cases were scheduled on the same day. One the day of court, I even witnessed the other girl and her friends making harassing statements to my client and her family outside of the courtroom. After going through the facts and the discovery in this case, it was definitely clear that my client assaulted the other student. However, I felt uncomfortable having her admit to this charge when she was feeling victimized. I didn’t think probation would serve the purpose of juvenile court. It may have taught her not to hit another student, but it wouldn’t necessarily prevent her from facing similar situations in the future. In this case, she had done everything asked of her. She contacted school officials, spoke to a guidance counselor, and told her parents. The court counselor who was supervising my client had positive things to say about her and how she was doing in school. We spoke with district attorney and arranged an informal deferred prosecution for my client. We continued the case for about three months. During that period, she successfully met established conditions and the charges were dismissed. I was really happy with the result in this case. While I do wish she didn’t have to be supervised at all, I was happy that my client didn’t have admit to a charge that was result of bullying. I know that informal deferred prosecutions aren’t options for every child or in every jurisdiction. If the client isn’t immediately diverted by the Department of Juvenile Justice, what are the other options? I have had other cases where deferred prosecution wasn’t an option for my client because he or she had other issues and concerns. In those cases, mentioning bullying and how my client responded to it was helpful in disposition. The initiatives to end bullying are extremely beneficial and have made remarkable progress in the school system. I do think that while bullying still exists, there is a challenge for juvenile defenders and the juvenile justice system to address how the court deals with juveniles who are also victims of bullying. Yolanda Fair is an Assistant Public Defender with the Buncombe County Public Defender’s Office in Asheville. Please read this heartfelt blog by Professor Tamar Birckhead regarding shackling. And for defenders, here is the statute regarding shackling. For further information on the harms of indiscriminate shacking, please see the great work by David Shapiro and the Campaign Against Indiscriminate Juvenile Shackling.